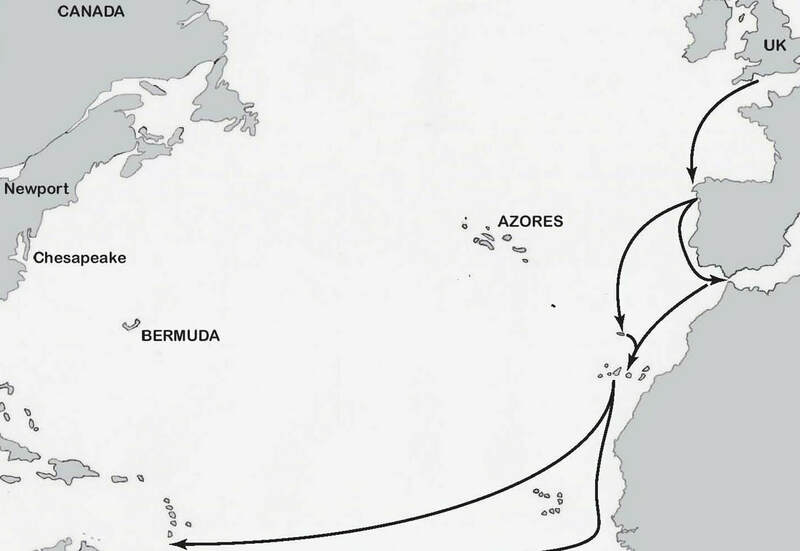 One particular route across the Atlantic is known as the Milk Run because it is about as easy as any ocean sailing passage can be. Now that I’ve done it I think it probably is, but I wasn’t so sure back then. I mean, how do you feel to be 2,000 miles offshore in a boat that is a lot smaller than the last wave that just went past and with another 1,000 miles to go before you sight land? The Milk Run was the obvious route for my first Atlantic crossing and it isn’t a bad route when you are unsure of what the ocean might hold. I’m glad I choose a southerly version of the route and left Africa late. When sailors complain about the surprisingly rough crossing they had it is often on a more northerly track, aiming to make the most direct course they can from the Canaries to somewhere in the middle of the Caribbean chain, and going sooner in the season than I did. The whole point about choosing the Milk Run is to have the Trades behind you and travel at the most comfortable speed. After all, you’ll be out there long enough whether you make a fast passage of under 20 days or a mediocre one of more than 25 days. But you can't isolate the Trades from weather events around them. These winds are the most constant of winds anywhere on the planet but they are generated by the pressure gradient between the low pressure at the Doldrums and the Azores High. If the Azores High has been pushed out of place by a low pressure system then the Trades may be light until you get further south than usual; if you were planning on staying up to the north after the Canaries and aimed at the centre of the Lesser Antilles you might even be getting head winds. This is another reason to be flexible about your starting point. Go somewhere like Senegal or the Cape Verdes to be far enough south for the early Trades; or leave your departure to January or February when the Trades will be well established and the tropical hurricane season is well and truly over. As we travelled down the Iberian coast and through the Atlantic Islands I came to realise that you don’t need to be fussy about the kind of boat you are sailing; and when we arrived in the Caribbean and saw the other boats that had crossed from Europe I concluded that almost any boat will get you across the Atlantic on the Milk Run. We sailed there and back on heavily built, long keeled double enders ideal for the ocean but other people sailed conventional production yachts or boats they built at home (but really shouldn’t have bothered). Some boats weren’t big enough for their crew to lie down in, never mind carry luxuries like a water maker and extra batteries. Many of these boats cost less than a decent water maker so they were never going to have such gear anyway. These weren’t Oysters or Swans or even Rassies and they didn’t feel the need to be equipped like those brands. Their idea of “simple” was possibly basic even by my standards but their idea of simplicity is a good thing for you to take heart from. When Lin and Larry Pardey upgraded from 24 foot to 27 foot they still didn’t feel the need for an engine. I have heard them berated by some sailors for being out of touch with the modern world and advocates of hair-shirt cruising but their idea of simple has got them to some very far off places in their little boat. I learnt, if I didn’t already know it, that sailing independently allows you to set your own priorities when planning this adventure. When sailing offshore self-reliance is the key to most things. One lesson I cannot stress enough is to start thinking like an ocean sailor before you become one. You don’t need to be in your home port to do work on your boat. I so enjoyed sailing to the Caribbean that I wanted to encourage others, hence I wrote Your First Atlantic Crossing to set out our experiences of a real voyage and in the later editions I put in more about the return crossing: our the observations on such things as night sailing and what we learnt during our return trip down the Iberian Peninsula when we met a new crop of first-time Atlantic sailors heading for their own Milk Run. Every one of those sailors was demonstrating a truly admirable independent spirit. I took the conventional Milk Run but with a side trip to Senegal which, in many ways, was the highlight of the voyage. And that, in part, made me think about an alternative for those able to plan ahead more decisively than I did. If only I had known then what I know now.